The first time I heard this was on a late night whistle test, one of their old play the track to some old archive footage slots. Those evocative heroic lost world images never left me and are always conjoured up when I hear it or read about! If there's anyone not too exhausted to read another review check out my take at wwww.clarkechroniclersalbums.blogspot.com/2010/03/1-tubular-bells-mike-oldfield . This is the second album we've both covered. Note my overestimate of MC's productivity ! 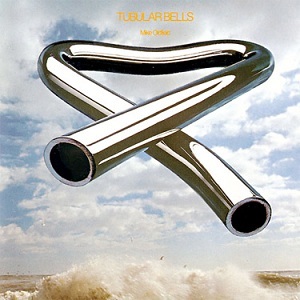 The idea of Tubular Bells being largely recorded on a Revox, using varispeed and sound-on-sound, was a huge inspiration to 10-yr old me - and, as you point out, a generation of DIY-ers too, I'm sure. This is an excellent re-evaluation (a re-evaluation from my perspective, at any rate, as I haven't thought about TB in years, and I'm not sure how anyone rates it these days). I only wish you HAD gone into more detail on Part One, which plays in my head pretty much perfectly. I remember one section from it being used in a milk advert around 1975, milk float coming up the hill, mock tudor semis on either side, a cold autumnal mist surrounding it. A perfect accidental video. Fancy a gently extended re-write? Don't recall that ad making it to Scottish TV; I should look it up on YouTube. Fascinating write up, in particular to learn about Centipede. However I've never warmed to this album, every time I dig it out of my vinyl collection and give it a burl I find myself thinking "What's all the fuss about." Maybe I should try again? I'm fully cognizant regarding its importance kick-starting Virgin and allowing all those great cult records to emerge by Gong etc. Not many of those records would have made No # 1! Maybe I only needed one Mike Oldfield album, but Hergest Ridge never connected with me. This one, yes I was a DIYer and two cassette machines meant I could sort of produce my own music in the style and mode. Anyways, it wasn't going to be called "Tubular Bells", it was either "Opus One" (Oldfield's suggestion), or "Breakfast in Bed" (RBranson's). But, after Viv's session, there could only be one title. i was an impressionable 7-year-old when i first heard this (my mum bought it cos it was the 'in thing', but i don't think she ever 'got' it. i was fascinated by it. played it over and over. i couldn't understand how one man had managed to play all those intstruments (multi-track recording an unknown concept to my young mind). i still think this record had a very big hand in directing my future interests. great review, marcello! I've always thought the Floyd's "Atom Heart Mother" would have been an obvious influence to Mike for "Tubular Bells".